The Vermilion Cliffs are a massive facade of psychedelic red sandstone, towering 3,000 feet above Arizona’s Highway 89A. Last Sept. 26, nearly 300 people gathered here with their binoculars, eagerly waiting to see three California condors being re-introduced into the wild in The Peregrine Fund’s 20th annual public condor release. One of the birds, Condor 618, poked its bald pink head out of the release pen and performed a clunky walk-run to the edge of the cliff before soaring majestically into the air. Within the next couple of hours, the other two younger birds had also flown out into the Arizona skies. Now comes the hard work for biologists. They must continue to monitor the birds closely, collecting an overwhelming amount of data — so much that researchers are starting to turn to volunteers from the public, known as citizen scientists, for help. Together, they must ensure that the condors integrate with the rest of the more than 220 free-flying condors swooping around Arizona, Utah and California; roost away from ground-dwelling predators; and remain healthy in the face of the threat of lead poisoning. “Releasing birds at approximately a year old, in the absence of their parents, puts them in a very vulnerable position,” says biologist Chris Parish, director of The Peregrine Fund’s condor recovery project, who was in charge of the event. Condors have been endangered since 1967. Because of the threat of lead poisoning from bullet fragments in the animals they scavenged, the condors were getting sick and dying in greater numbers than they could recover by natural breeding alone. Although California condors live an average of 60 years, they don’t breed until they are between 6 and 8 years old, and the female lays only one egg every two years. So biologists have raised condors under an intensive captive-breeding program since 1987, when all condors but the 22 in captivity became extinct in the wild. Four years later, they began releasing the young condors into the wild so they didn’t become too dependent on humans for their survival. The program was a success: There are now more than 120 California condors flying free in Central and Southern California, 70 in Arizona and Utah and 30 in Baja California, Mexico. But biologists still need to go out into the field nearly every day to check on the condors’ health and track how far they fly using radio or GPS transmitters on their wing tags. Scientists have also begun placing cameras at feeding sites to watch how condors interact with each other when they eat. Sometimes the photos can even provide an early warning about illness, for example if the condors are behaving in an unusual manner. But the sheer number of photos collected is so high that biologists are now enlisting the help of citizen scientists to filter through them. These volunteers and science enthusiasts, recruited by websites like Condor Watch, can access images taken by motion-activated cameras at release sites in California. They can also identify tag numbers and consult a fun biography of the condor in their photo. Volunteers can also mark the distance to feeding sources, such as animal carcasses, and identify other animals nearby, from turkey vultures and golden eagles to coyotes. In the last month alone, Condor Watch received 11,927 total page views. And by visiting the website and providing information biologists need, members of the public can actively participate in scientific research on condor behavior and the lead poisoning that remains the biggest threat to their survival. 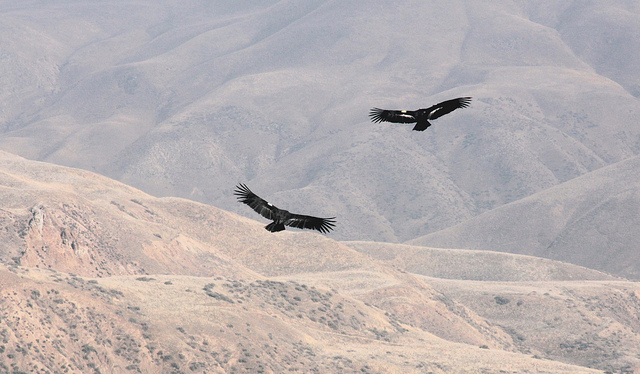 While biologists know how California condors get exposed to lead, they don’t yet have information regarding what role the condors’ behavior and interaction with their social group plays. And since condors are highly social animals, researchers say that analyzing this information from Condor Watch may add a crucial piece of information to the puzzle. “This will help us understand whether the social network of a condor puts it at risk for lead poisoning,” says Myra Finkelstein, an environmental toxicologist at the University of California, Santa Cruz. “It’s a problem at a much larger scale than condors. It’s kind of an environmental health and human health problem,” says Finkelstein. Because lead-based ammunition is the most common type used nationwide, she says, it is not only a threat to all scavenging animals, but also to hunters who eat meat shot with it. California legislators have approached the issue by banning lead in ammunition, in a law that will go into full effect by 2019. In Arizona, however, much of the focus is on outreach and awareness. Conservationists have been asking local Native American Paiute hunters and others to choose alternative ammunition by educating them about the harmful effects of lead. Last year, Chris Parish says The Peregrine Fund was able to garner 90 percent volunteer participation during the big game-hunting season, meaning that hunters either used non-lead ammunition or retrieved the remains of their lead-shot animal carcasses from the field. Eventually, Finkelstein hopes that Condor Watch could expand to Arizona or the condor population in Baja California, too. That would allow even more people to be involved in saving these majestic birds.